In 2011, Janette, her husband, and eight children fled from the Democratic Republic of Congo to Kampala, Uganda. In fleeing to Uganda, Janette’s family left behind all their assets and properties. Her husband, who was a professor in DRC, struggled to find work in Uganda. After two years, Janette knew that she needed help so that her children could have a better life in Uganda, so she went to the JRS office in Kampala. She asked for support in her pursuit to secure an income to sustain her family. In response, JRS enrolled Janette in the adult English classes, a 12-month course designed to achieve a level of English proficiency necessary for working in Uganda. Janette then enrolled in JRS’s three-month Arts and Crafts course, one of the many courses JRS Uganda offers through its livelihoods program supported by the U.S. Department of State Bureau of Population, Refugees, and Migration and JRS/USA. 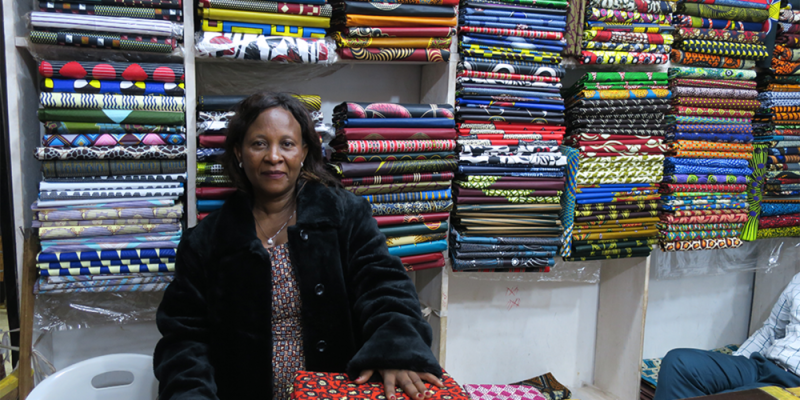 Upon completion of the course, beneficiaries like Janette participate in a business development course aimed to equip graduates with basic business knowledge and tools to enhance their employability or successfully run their own businesses. Janette is very happy with her textile shop and now can provide for her children. Her business is now a family affair, with her husband and older children helping her in the expansion business. And, she’s also helping other refugee women and mothers make a living by leasing store space to them, and teaching what’s she learned about being a refugee, a mother, and an entrepreneur.